You might normally associate these household brands with washing machines, televisions, or your personal computer, but these companies are now bringing their technology to horticulture and agriculture. You may know Panasonic for their cameras and televisions, but according to a presentation given at Smart Horticulture Asia exhibition in Hong Kong last year, their world vision is one of robotics integrated into all modern life activities to tackle environmental, medical, resource, labour and food issues. Panasonic are currently creating a tomato harvesting robot - their first step towards enhancing the horticulture industry by adopting robotic technologies. Find out more. 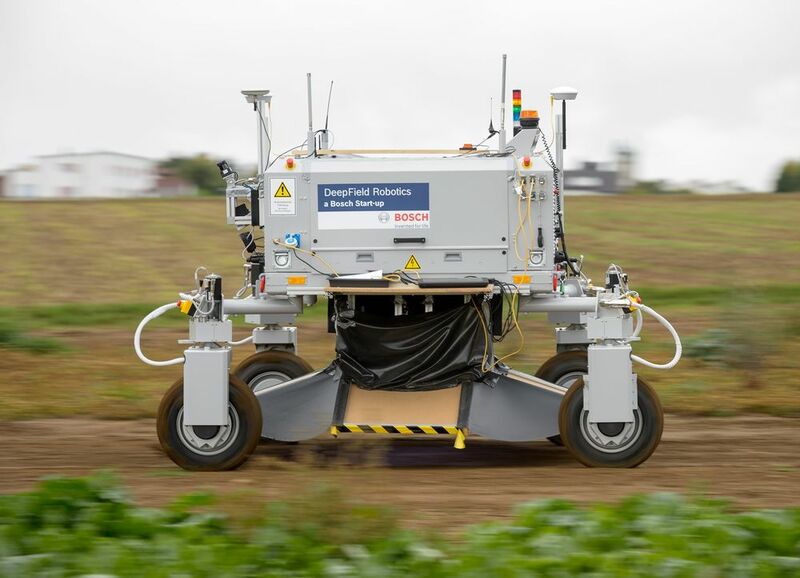 Deepfield Robotics is a start-up company funded by Bosch who are creating a mechanised way to tackle weeds in the field. The field vehicle, called ‘BoniRob,’ can distinguish between crops and weeds and any unwanted plants are rammed into the ground. Deepfield Robotics are also developing sensors for strawberry, tomato and asparagus production. FARMSTAR is a decision-support tool designed to help with precision application by using multi-sensor images combined with agronomic algorithms. It has been created by Airbus Defence and Space, who supplied their expertise in satellite image processing, along with Arvalis, Plant Institute and Terres Inovia, who supplied the agronomic knowledge. Distribution is currently in France only. Read more. Tencents are a leading provider of internet services in China, who have recently sponsored an autonomous greenhouse challenge at Wageningen University, Netherlands. Five international teams competed to produce a cucumber yield remotely and without human intervention. And the winners…. A team of researchers from Microsoft! So does that mean computers are better at growing than people? Click here to read the full results. In addition to their successful autonomous glasshouse challenge team, Microsoft has been working on Farm Beats, a project to increase farm productivity through data. Microsoft identified that getting data from farms is difficult with often no internet or power in fields, and so are working on solutions through low-cost sensors, drones and vision and machine learning algorithms. Find out more about Farm Beats. Hummingbird Technologies is an artificial intelligence business, using imagery and data analytics to create high-resolution maps of crops. The tech company has received the backing of several big name companies, including The European Space Agency and Sir James Dyson.